This small app is for easily determining the capacitance value of any capacitors that you may have on hand by entering the code written on the cap surface. Use the first two spin buttons to set the initial two code digits from your capacitor. If there are three digits then enter the third digit in the third spin button control. example: 10 pF = 1 0 0 , 100 pF = 1 0 1 etc. The tolerance value is set using the drop-down combobox and is displayed automatically. 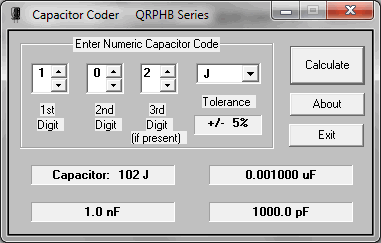 Tolerances that specify +/- pF values are generally used on capacitors that are 10 pF or less. This app should do all practical standard value capacitors.